A group of 50 students from Denver and Weld County based Boys & Girls Clubs will experience first-hand what it takes to become an Olympic Athlete. Olympic Athletes do not achieve success overnight. They set goals and through years of hard work, perseverance, calculated decision making, and sacrifices, they transform their dreams into reality. Moreover, Olympic Athletes routinely practice the values of teamwork, dedication, friendship and respect – values that all young adults should learn and apply to their everyday lives. The Foundation for Global Sports Development (GSD), a long-time supporter of the Olympic and Paralympic Movement, constructed their Playmakers Program to share the Olympic experience with underserved youth from around the world, with the program being first introduced at the 2004 Athens Summer Olympics. Thanks in part to the collaborative efforts of the United States Olympic Committee, in 2016 the program will experience a milestone with its first pre-Olympic event designed to expose youth to new levels of inspiration as they interact with athletes who are training for the Rio Summer Olympic Games. Beginning March 31st, The Boys & Girls Club youth will spend 4 days and 3 nights at the Colorado Springs based Olympic Training Center. The interactive experience will open with a torch lighting ceremony and include athlete presentations, Olympic sporting demonstrations, team building activities and unique sport experiences, educational sessions, and will conclude with a medals ceremony on April 3rd. The Playmakers Program has a proven track record of inspiring positive lifestyle choices in youth who participate. “We’ve had Playmakers Program alumni come back to us over the years and tell us what a remarkable experience this was for them,” said Dr. Steven Ungerleider, Executive Board Member for GSD. “Playmakers youth take home the values of Olympic and Paralympic sport and are able to apply those to everyday life. It has been extremely rewarding to witness the positive impact this has on their future,” added GSD Executive Board Member, David Ulich. For more than 100 years, Boys & Girls Clubs of America (GreatFutures.org) has enabled young people most in need to achieve great futures as productive, caring, responsible citizens. Today, more than 4,100 Clubs serve nearly 4 million young people annually through Club membership and community outreach. Clubs are located in cities, towns, public housing and on Native lands throughout the country, and serve military families in BGCA-affiliated Youth Centers on U.S. military installations worldwide. They provide a safe place, caring adult mentors, fun, friendship, and high-impact youth development programs on a daily basis during critical non-school hours. Priority programs emphasize academic success, good character and citizenship, and healthy lifestyles. In a Harris Survey of alumni, 54 percent said the Club saved their lives. National headquarters are located in Atlanta. Learn more at http://www.bgca.org/facebook and http://bgca.org/twitter. Founded in 1894 and headquartered in Colorado Springs, Colo., the United States Olympic Committee serves as both the National Olympic Committee and National Paralympic Committee for the United States. As such, the USOC is responsible for the training, entering and funding of U.S. teams for the Olympic, Paralympic, Youth Olympic, Pan American and Parapan American Games, while serving as a steward of the Olympic and Paralympic movements throughout the U.S. For more information, visit TeamUSA.org. 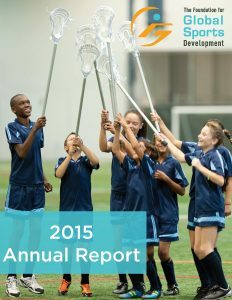 Our 2015 Annual Report is now available! Take a peek inside to learn about our newest award, the Exceptional Youth Scholarship, and see what else did in 2015. Download the entire 2015 Annual Report (PDF, 1 MB) here, or view each section separately below.